Do you need a wheelbarrow for gathering and transporting trimmed twigs, cut weeds, and soil? Whatever your purpose of requiring one, make sure you buy the right one. Experts say that the best wheelbarrow is multifunctional and reliable enough to help you do a lot of tasks. When choosing a wheelbarrow, you should determine what it will be used for since this decision plays a huge factor in what size and shape the product should be. This will also help you purchase a wheelbarrow that has the right weight or load capacity. With all those in mind, we have searched the market and found three wheelbarrows that might just be the perfect one for your needs. The wheelbarrows we chose are some of the top-selling models today. We have carefully looked into each of their features, as well as benefits and drawbacks of using them. Available in green color, the Best Choice Products Home Wheelbarrow camouflages in nature. Does it have the quality and features that make it worth the price? Construction: The Best Choice Products Home Wheelbarrow is constructed using powder-coated steel, polyurethane, and rubber materials. All of which makes most of the wheelbarrow parts resistant to rust. Handle: The handle attached has a thickly padded rubber loop for a comfortable grip. Likewise, it makes pushing and lifting easier and more convenient. What is better is that this rubber loop doubles as a stand for easy lifting. It also supports and makes the wheelbarrow stable even when loaded with a heavy object. Wheels: The two, 13-inch rubber wheels steer smoothly and have been designed to withstand shock even in rough pavements. Maximum capacity: Since the Best Choice Products Home Wheelbarrow has a strong steel frame, it can carry and support heavy objects and tools. It can contain up to approximately five cubic feet or 265 pounds. It is also deep enough for difficult and straightforward tasks. 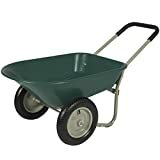 Size and weight: The Best Choice Products Home Wheelbarrow has an overall dimension of 36 inches by 25 inches by 20 inches and weighs roughly 330 pounds. With its practical dimensions, it can be stored conveniently without occupying too much space. As such, you can keep it safe from wear and tear, especially during extreme weather conditions. Functionality: The durability and size of the Best Choice Products Home Wheelbarrow make it a multifunctional outdoor tool. It is easy to maneuver and helps transport plants and other items safely and efficiently. If you are looking for a pretty affordable wheelbarrow, the Marastar Garden Star Wheelbarrow is a good choice. It is perfect for accomplishing small tasks in the garden. Assembly: The Marastar Garden Star Wheelbarrow is easy to assemble since it only comes with six bolts. You also would not need any professional assistance. Handle: The loop handle of the Marastar Garden Star Wheelbarrow makes it convenient to lift, control, and balance the loads it carries. As similar to the first product, the loop handle also serves as the support of the wheelbarrow. Wheels: The Marastar Garden Star Wheelbarrow features two, air-filled, rubber tires that make it easy to pull, push, and maneuver. Maximum capacity: This wheelbarrow is designed to be stable and sturdy enough to carry various kinds of loads as long as the weight does not exceed 50 pounds. Size and weight: The Marastar Garden Star Wheelbarrow has dimensions of 37 by 25.5 by 27 inches and weighs about 20.1 pounds. With such a size, this can be stored in your garage or storage room without taking too much space. Functionality: Since it is a durable yet compact barrow, it is excellent for weeding, hauling, and other small garden projects. Its poly tray can transport gravel, sand, soil, dirt, and mulch. Are you looking for a petite wheelbarrow for your little one? Well, the Seymour Poly Tray Wheelbarrow has the right size for kids who wish to help you with your outdoor tasks. Since it is not intended for heavy gardening tasks, what are the things that make it to the top-selling list? Construction: The wheelbarrow is made of wooden, plastic, steel, and rubber materials. On its back is a steel cross bracket to support the contents. The tray is rugged and made of plastic with front, steel braces to provide support and stability. Handle: This red wheelbarrow has two handles that are made of hardwood material. They are about 16 inches above the ground. These handles are connected to the wheel for easy control. Wheel: The Seymour Poly Tray Wheelbarrow has a well-made rubber tire with ball bearings which help the wheel roll out smoothly. 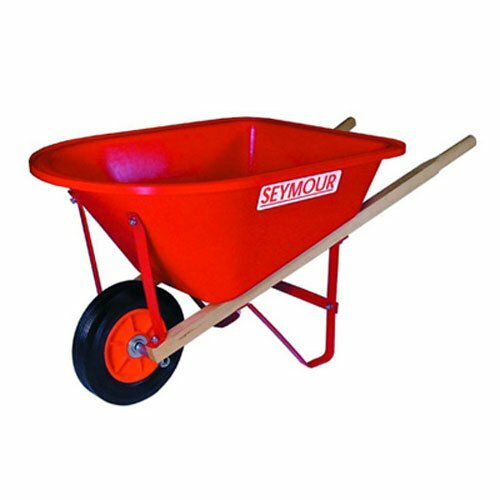 Size and weight: The Seymour Poly Tray Wheelbarrow is a junior size wheelbarrow, specifically 25 x 17 x 9 inches. As per its weight, it is approximately 29 pounds. Functionality: Although this is considered as a child’s wheelbarrow, it has the actual wheelbarrow features. Thus, it is not only great for playing and helping out outdoors, but also for having fun indoors. It can be used by kids for collecting soil, weed, and sand as well as for gathering toys. The three best wheelbarrows above are intended for different users. Their general difference is their size and weight. Being the smallest and lightest, the Seymour Poly Tray Wheelbarrow is recommended for parents who want to teach their children cleaning up tasks, whether indoors or outdoors. 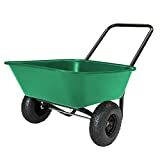 On the other hand, the Marastar Garden Star Wheelbarrow is for individuals who have small to medium gardens or backyards or those who just handle light-duty tasks. Lastly, the Best Choice Products Home Wheelbarrow is designed for those who have large outdoor living space or who will carry and transport heavy loads. That being said, among the wheelbarrows featured in this article, the Best Choice Products Home Wheelbarrow stands out for us. That is because it can be used for simple and complex tasks, making it versatile. Additionally, it has thickly padded loops for easy handling and maneuvering, as well as rubber wheels that roll out smoothly and withstand different terrains. Made with durable materials and designed with attention to details, the Best Choice Products Home Wheelbarrow is well worth the price.